The mood on Wall Street this week is cautious, but hopeful. NEW YORK — A stunning about-face in bank shares handed the stock market its best week since November. The market has shot up as much over the past several days as it might in some years, with major indicators chalking up gains of around 10 percent. Friday's gains were modest compared with the huge rallies on Tuesday and Thursday, but investors welcomed the moderate buying and the market's ability to hold its ground. Several other recent rallies have ended with disappointing selloffs. 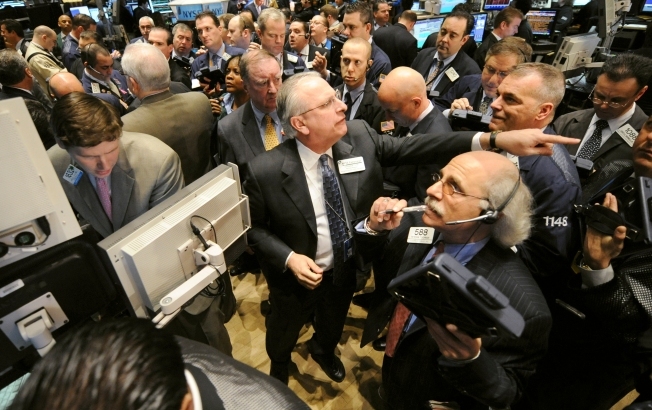 The Dow Jones industrial average rose 53.92, or 0.8 percent, to 7,223.98. The Dow hasn't put up four straight gains since late November. For the week, the Dow jumped 9 percent, its best week since rising 9.7 percent in the week ended Nov. 28. Fears have eased that the nation's major financial institutions would collapse or at least require additional government lifelines to stay alive. Market veterans were quick to rein in hopes that the market would chart an uninterrupted recovery but many still saw the four straight days of gains a good sign. "The biggest question for investors now is, 'Have we put in the lows and is it safe to get back into the water?' " said Michael Sheldon, chief market strategist at RDM Financial Group. Other market indicators also gained. The Standard & Poor's 500 index rose 5.81, or 0.8 percent, to 756.55. The Nasdaq composite index rose 5.40, or 0.4 percent, to 1,431.50. The S&P 500 index added 10.7 percent for the week and the Nasdaq rose 10.6 percent. The Dow Jones Wilshire 5000 index, which reflects nearly all stocks traded in America, jumped 10.7 percent. That's a paper gain of about $900 billion. Still, the Dow and the S&P 500 index are still down by about half from their peak in October 2007. Traders are often reluctant to hold on to large positions ahead of the weekend out of fears that bad news could be on the way. This coming weekend is packed of events that could have a great affect on trading next week. Finance ministers and central bankers from the Group of 20 countries are meeting Friday and Saturday outside London, and Federal Reserve Chairman Ben Bernanke will discuss the financial crisis in a rare interview to be broadcast on CBS' "60 Minutes" Sunday. Energy stocks dragged on the market ahead of a weekend OPEC meeting on whether the cartel should adjust oil production. Health stocks rose, while financial companies and technology shares wavered after posting big advances this week. Financial stocks showed uneven advances following reports that Citigroup Inc. Chairman Richard Parsons said the bank doesn't need additional government support. Word that Citigroup, which has received three rounds of emergency funding, was having its best quarter since 2007 touched off the rally Tuesday. Bank of America Corp. and JPMorgan Chase & Co. also said this week that they have been profitable so far this year. The market has been quick to embrace the encouraging signs about the financial system after weeks of unrelenting selling spurred on by concerns that the government's efforts to break a freeze in lending weren't working. Despite the glimmers of hope, analysts are still a long way away from declaring that the worst is over. "We are going to remain cautious because the slightest bit of bad news could turn this thing around," said Joe Arnold, investment adviser at Dawson Wealth Management. Analysts said technical factors that helped drive the market for the week continued Friday, including short-covering, when traders buy stock to cover "short" trades in which they bet a stock will fall. Upbeat reports from companies in a range of industries lifted stocks after stocks finished at their lowest levels in more than 12 years on Monday. General Motors Corp. said Thursday it wouldn't need the latest installment of government bailout money, and a cut in General Electric Co.'s credit rating on the same day wasn't as bad as some had feared. Also feeding optimism about banks this week was news that an accounting board may recommend an easing of financial reporting rules of tough-to-sell assets. Banks say a change in so-called "mark-to-market" accounting rules would help their bottom lines. On Friday, Citigroup rose 11 cents, or 6.6 percent, to $1.78, while Bank of America fell 9 cents, or 1.5 percent, to $5.76. Wells Fargo slipped 1 cent to $13.94. General Motors extended its gains on Friday, jumping 54 cents, or 24.8 percent, to $22.72. For the week, GM rose 88 percent. More than 2 stocks rose for every one that fell on the New York Stock Exchange. Trading volume came to 1.61 billion shares. Bonds were mixed. The yield on the benchmark 10-year Treasury note, which moves opposite its price, rose to 2.89 percent from 2.86 percent late Thursday. The yield on the three-month T-bill fell to 0.21 percent from 0.22 percent Thursday. Light, sweet crude for April delivery fell 78 cents to settle at $46.25 a barrel on the New York Mercantile Exchange. Overseas, Britain's FTSE 100 rose 1.1 percent, Germany's DAX index slipped 0.7 percent, and France's CAC-40 rose 0.4 percent. Japan's Nikkei stock average jumped 5.2 percent.